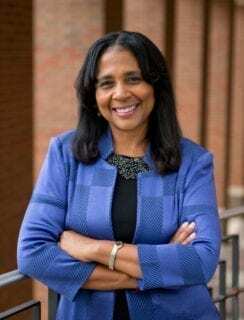 President Angela L. Walker Franklin, Ph.D. Welcome to Des Moines University, a health sciences university in the vibrant, capital city of Iowa. We are privileged to serve the people of Iowa and the students who join us from around the nation. Founded in 1898, Des Moines University comprises three colleges offering eight graduate degrees in medicine and the health sciences. We share a singular mission to improve lives in our global community by educating diverse groups of highly competent and compassionate health professionals. Every day, our people bring passion and delight to their work in providing important impacts in health sciences education, research and public service. Our faculty have developed an academically rigorous curriculum designed to stimulate and support students in the acquisition of advanced knowledge and skills. Our students are highly motivated, intelligent and compassionate. They volunteer with community organizations and are fully imbued with the University’s commitment to public service. They apply their learning to make a tangible difference in the world. The faculty and professional staff of DMU work to foster a campus climate that does not just tolerate differences, but that treasures and nurtures the diversity of our society. It is proven that we become better citizens of this world, and better health care providers, when we learn from and value our differences. While many of our graduates practice in the state of Iowa, many embrace opportunities to provide care around the world. We meet these challenges by emphasizing training in primary care and encouraging graduates to practice in rural and underserved areas. In fact, the University has been recognized as the nation’s top producer of primary care physicians. We also serve our community through the multi-specialty DMU Clinic. We offer family medicine, podiatric medicine and surgery, physical therapy, osteopathic manual medicine and international travel health services in thousands of patient visits annually. I could not be more proud of the passion and commitment that members of the DMU community demonstrate every day. We strive to live our values of honesty, accountability, collaboration and inclusiveness which we believe are the basic tenets of integrity. And, we also cherish the role we have in preparing the next generation of health professionals in an environment that fosters respectful dialogue and genuine kindness. We invite you to join us and embrace our special call to service!